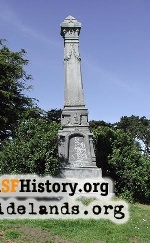 A grave monument to sailors still stands in today's Lincoln Park. On a drive of the Lincoln Park golf course stands an interesting metal hazard for players. 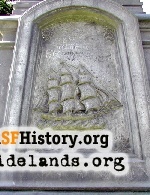 A monument fifteen feet high, decorated with nautical reliefs of anchor and sailing ships, the stile is left over from the days when Lincoln Park served as the City Cemetery. Presented to the Ladies' Seaman's Friend Society by Dr. Henry D. Cogswell. A landmark of the seaman's last earthly port and resting-place in which he awaits the advent of The Great Pilot for his Eternal Destiny. Dedicated to Mrs. Rebecca H. Lambert, the founder of this society who, by universal consent, has merited the unqualified and lasting gratitude of the seaman's friend for her unselfish and lifelong devotion to their cause. 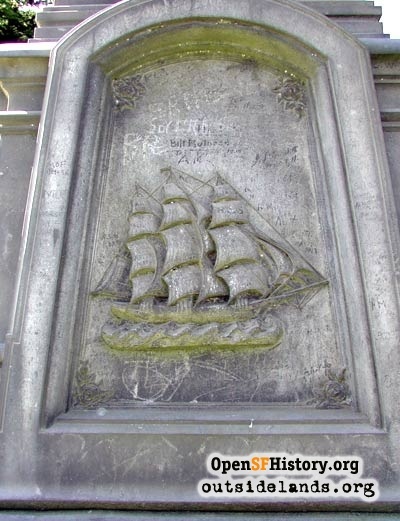 Part grave marker for sailors, and part testament to Mrs. Lambert's good work on the behalf of the seaman, the marker was originally well-located for its purpose. 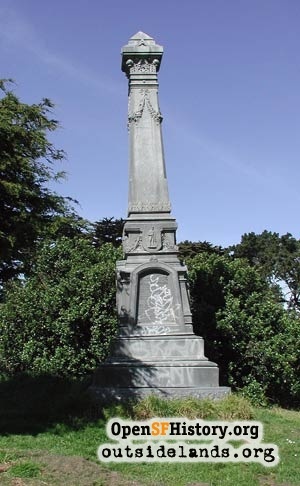 The City Cemetery may have been the place where the poorer classes, such as sailors, were interred, but it also offered a magnificent and fitting view of the Golden Gate and the Pacific Ocean. The different societies and nationalities have plots on all sides, but they are generally well kept and decent. The ground alone is wretched and forlorn. High on the hill there are clustered a few graves close to the edge of the cliff where it sheers into the water. "Them's mariners," said the gravedigger, who stood dreaming on his shovel, and flicking a curly dog with a coffin rope. "They're put there so'st they can see the ships come in." The mariners have decidedly the best of it, for though their little plot of ground is bare enough, in all conscience, it is not quite so miserable as the rest. The wind rushes in from the sea and shakes the rattling branches of the scattered brush. Sometimes it overturns a tottering board or blows a broken paling from a falling fence. The place looks as if the gravedigger and his curly dog were the only visitors that ever came to visit it. The neglected cemetery gave way to a city park in the 1910s, with the bodies supposedly all moved to new graves in Colma. Renovation work on the nearby Legion of Honor museum in the 1990s uncovered, however, many, many remains. So perhaps a goodly number of seaman still reside around their memorial. 1. "Desolate and Forsaken. Neglected and Forlorn Condition of the City Cemetery," San Francisco Examiner, 3 February 1891, page 3. Contribute your own stories about western neighborhoods places. !